Housed in the Hermitage Museum along with other institutes, libraries, and museums in Russia and the republics of the former Soviet Union are some of the most magnificent treasures of Persian Art. For the most part, many of these works have been lost, but have been catalogued and published here for the first time with an unsurpassed selection of colour plates. 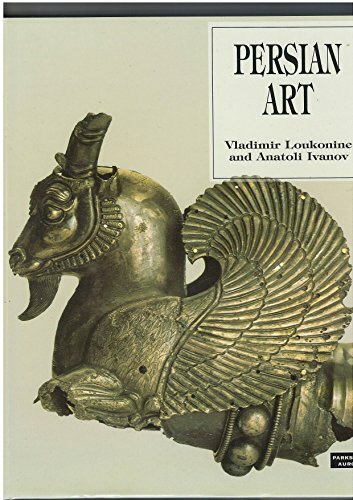 In a comprehensive introduction, Vladimir Lukonin, Director of the Oriental Art section of the Hermitage Museum, and his colleague Anatoli Ivanov have broadly documented the major developments of Persian Art: from the first signs of civilisation on the plains of Iran around the 10th century BCE through the early 20th century. In the second part of the book they have catalogued Persian Art giving locations, origins, descriptions, and artist biographies where available. Persian Art demonstrates a common theme which runs through the art of the region over the past three millennia. Despite many religious and political upheavals, Persian Art whether in its architecture, sculpture, frescoes, miniatures, porcelain, fabrics, or rugs; whether in the work of the humble craftsmen or the high art of court painters displays the delicate touch and subtle refinement which has had a profound influence on art throughout the world. Vladimir Lukonin (1932-1984) stood for two decades at the head of the Hermitage Oriental Department, assisted by his colleague Anatoli Ivanov, lead researcher. He published more than a dozen books, mostly on aspects of Parthian and Sassanian Iran and Central Asia.